As the temperature fell we toasted the future, in particular the immediate future, house sitting in Armidale, with a glass of red. Being forced into retirement is not necessarily a bad thing. We set about making a plan to house sit and travel our vast country, making the best of what we had by selling our personal goods and chattels. The next two months were a mixture of acceptance of the situation and the stress of dealing with the other people who were also affected, employees, shareholders, small creditors and friends. It’s difficult to reconcile a failure, despite having succeeded for 38 years. In the midst we had a family illness that required a trip to Brisbane for several weeks and the painful evacuation of the house. As we were about to be sans home and with no ‘dependents’ for the first time since we were in our youth, we made the decision to travel. 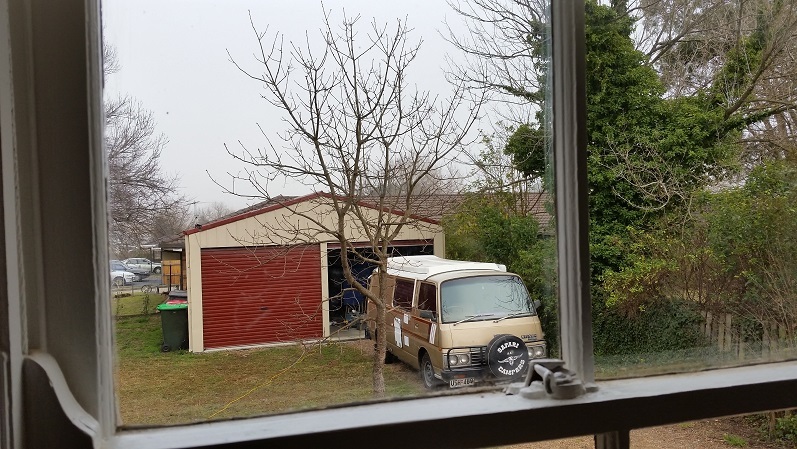 We subscribed to Aussie House Sitters and Julie sold her car. 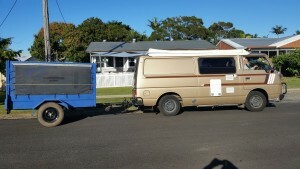 With the proceeds and a couple of garage sales to get rid of the rest, we had enough to buy the campervan and trailer. We figured that if we free-camped and spent some in-between-house-sitting time with family and friends, we could make a better plan as we went along. It turned out to be one of the best decisions we ever made. Nine weeks had passed since the axe fell and we were free. It was almost like being young again. I repeat, ‘almost’. We didn’t get very far. Within a couple of hundred kilometres one of the trailer wheels disappeared into the bush, never to be found. 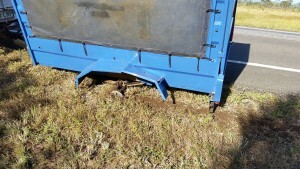 We had the trailer picked up and taken back to Bowen, the last town we passed. After getting a new hub and wheel fitted, we were back on the road, fortunately with no further adventures and at $500, it had only consumed 30% of our amassed fortune. 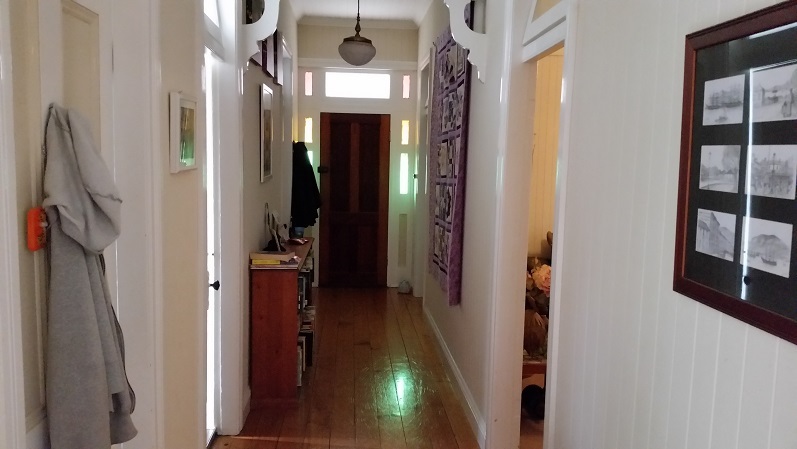 The house sitting website had come good and our first ‘sit’ was to be in the middle of winter in one of Australia’s coldest cities. Armidale also lays claim to being Australia’s highest city at 3,000 feet above sea level, not so high by international standards but notable in Australia. 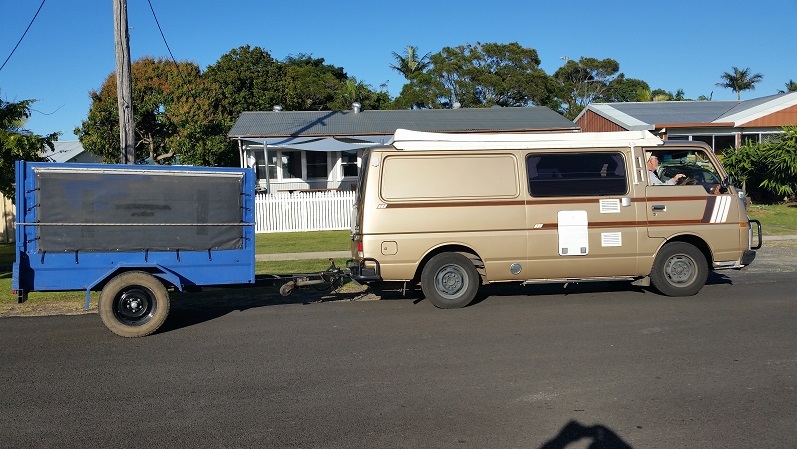 We had a few weeks grace to spend time in Ipswich with family to prepare the van and trailer for self- sufficiency, which means a small generator, spare water, a shower toilet tent and a few tarps. We already had some camping gear and the van had come equipped with a bed, fridge, stove and awning. On a frosty morning in June we set sail, heading for a family oasis in Ballina, the home of Julie’s brother Paul and his wife Carol, to finish last minute preparations. 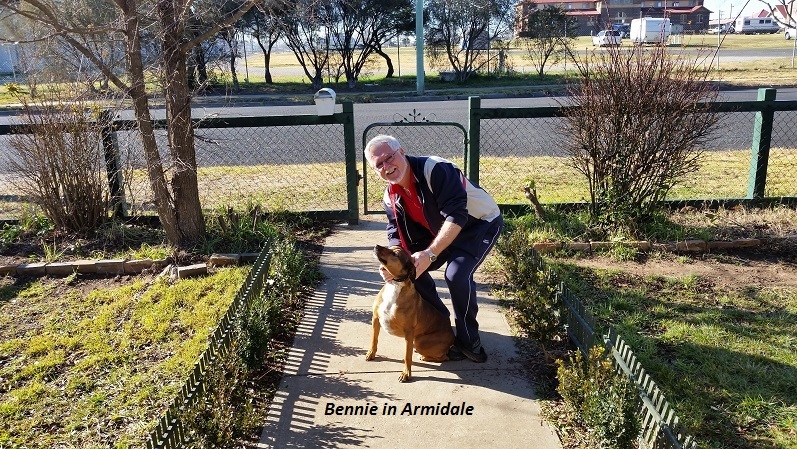 A couple of days later, on a not so frosty morning, we hit the road for the half-day run from Ballina to Armidale. It was fortunate we were not in a hurry as the van had only a small and well used engine to pull us and a loaded trailer up the range. We arrived at the house mid-afternoon the day before we were due to take over. We only met up with Angela and little Joseph as Angela’s partner Tim was playing soccer and young Lucas was somewhere else we can’t remember. Angela was warm and welcoming and the house had a very comforting feel so we immediately felt quite at ease, a very good start for our first ‘sit’. After a quick run-down on feeding Benny the dog and the six nameless chooks, we set up camp across the road in the showgrounds. It was threatening to rain but after having been given the OK to park under the cover of a large open roofed area, we headed up town to catch an already-cooked chook for dinner. People were polite and didn’t stare too much at my dress sense even though I was the only person in the city wearing shorts. 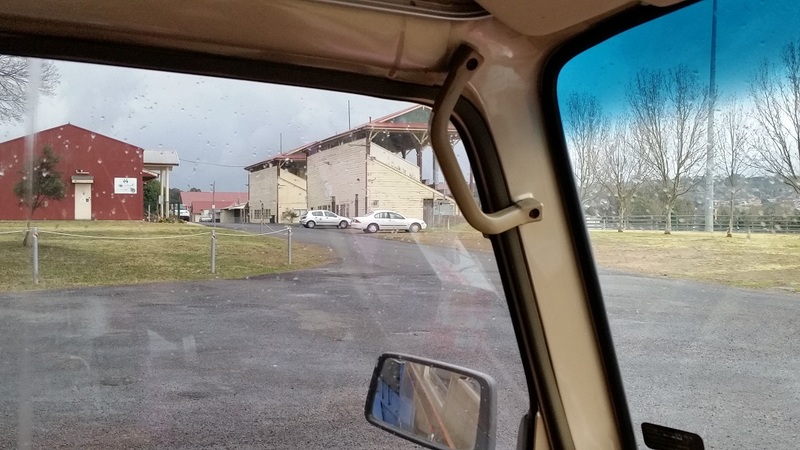 By the time we set up the van it was beginning to rain, the temperature had dropped to about 3 degrees and the lady in charge of the showgrounds once again showed us great hospitality and lent us a small heater. As the wind picked up and the temperature made its lazy way down to zero and beyond, we ate our chook, toasted the future with a glass of red. After the misery of the last half-decade we could not have been happier doing anything else. 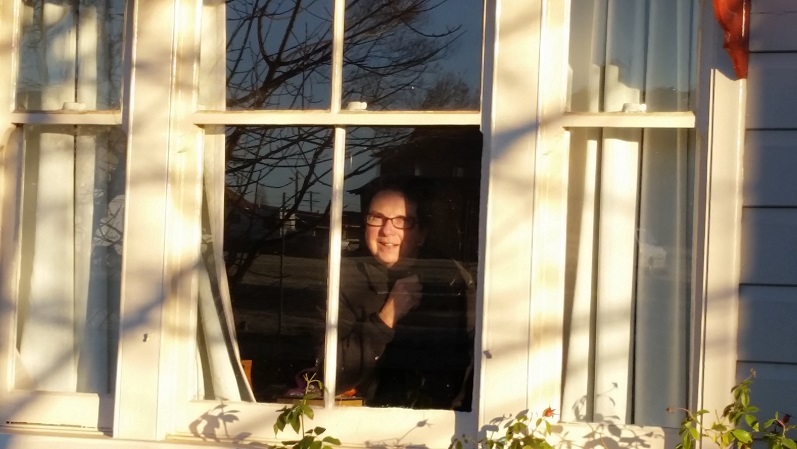 The next morning required some fortitude to get moving despite waiting until a respectable 9.30 before driving the 40 metres across the road to our new temporary home. Benny was not exactly pleased the family had buggered off without him but the chooks didn’t seem to mind. Benny and I were going to get along very well. It did not take long to settle in to our first official house sitting role, our new temporary home in Armidale. Benny quickly caught on that there was a substitute on the field and dinner would be served on time after all. The other benefit was the substitute, the old guy with the grey hair, was happy to play ball, throw and fetch, wrestling and most importantly, tummy rubbing. We were entertained by the prospect of lighting a fire. One does not develop this particular skill in the tropics and the prospect of chopping wood and having a fire place was a novelty.